There is a long list of health benefits of green bananas; however we have come up with some unique raw banana benefits through this write up. 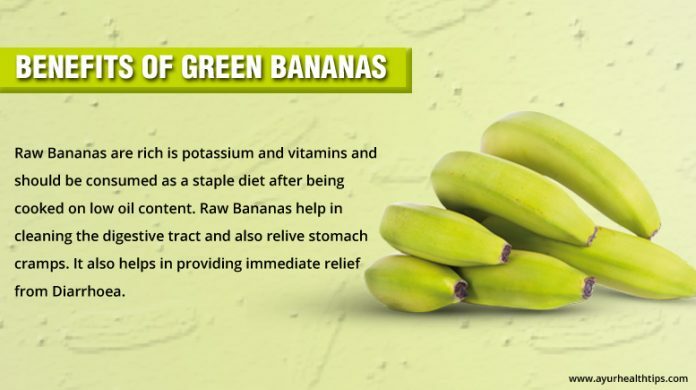 Read on to know why you should add green banana in your diet dish. While we all know how important it is to eat bananas every day for the nutrition it provides, the raw green bananas are also eaten in many parts of the world, for its reserves of vitamins and potassium. Rich in fiber and roughage they also help in cleaning the digestive tract. Apart from regularizing the passing of stool during diarrhea, it also helps in overall immunity of the body. Raw bananas are green in colour and need to be steamed to make them soft. Normally used as Curries in Indian cooking, it is blended with various spices to exhume the wonderful taste and texture of the vegetable. We give you two easiest ways to consume raw banana with breads or rice alike. Boil / Steam Raw bananas cut in small pieces and cook like other vegetables in very little quantity of oil. Grate a raw banana and stir fry it with all the spices. Make small cakes on the palm of the hands and shallow fry for a golden tinge. In either cases, the amount o oil to be used for cooking has to be very less. This is primarily due to the reason of the high vulnerability of the raw bananas to lose nutrition at high temperatures and frying. So while you try this new dish, always remember to eat healthy and maintain gaps between the meals to correct the natural metabolism of the body. Hope this write up inspires you to add this green fruit in daily diet regime to utilize possible health benefits of green bananas. Not just bananas, here is why even the Raw Form is divine!